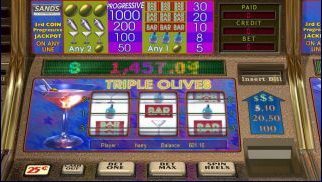 The Triple Olives is a three reel, three payline progressive slot machine that is connected to several online casinos. Triple Olives comes in two versions, a quarter machine and a dollar machine. Players can switch their coin value from $0.25 to $1 without changing to another machine. The dollar version usually has bigger jackpots available but the quarter machine can also have some quite healthy jackpots on offer. The slot has 10 winning combinations and no wild symbols. Players can now enjoy Autoplay feature of Triple Olives, which will allow the game to spin up to 99 times for you, saving you from having to click the Spin/Bet Max buttons repeatedly, or allowing you to continue playing should you need to leave your computer for a moment. The game will stop when the Autoplay has reached the number of spins that you specified, or when a bonus round is reached, or when you win a jackpot! You can click the "Stop" button at any time to halt the Autoplay feature. Max bet must be played to activate the opportunity for the progressive jackpot win. With this slot max bet comprises of one coin on each pay line, so it is highly recommended that you bet on all paylines or $0.75/$3 per spin depending on the game's version. The top payout on Triple Olives progressive jackpot machine is not fixed as in regular slot machines. Jackpot value start at a specific level ($1,250/$5,000 for $0.25/$1 games, respectively) and grows each time a player in any participating casinos makes a bet. This means the jackpot grows faster. You can now see real Triple Olives progressive jackpot winners stories and testimonials - the winners tell all. Note: If you bet max 3 coins, Triple Olive pays Progressive Jackpot that is greater than $1250 instead of $1000 on any payline.